Creates three-dimensional block maps on which levels of magnitude of the specified response variables are represented by blocks (bars) of varying height, pattern, and color. Requirement: At least one response variable is required. The ID statement must be used in conjunction with the BLOCK statement. specifies a data set to annotate onto maps that are produced by the BLOCK statement. specifies the width of the blocks. outlines all blocks in the specified color. outlines non-empty map areas in the specified color. specifies the shape of the blocks. specifies the width, in pixels, of the outline for all outlined blocks and for the outline of the map areas. specify the physical dimensions of the map to be drawn. specify coordinates of the viewing position in the reference coordinate system. specifies a color for the text in the legend. specifies the LEGEND statement to associate with the map. specifies the response levels for the range of response values that are represented by each level (pattern and color combination). displays value ranges in the legend. creates bars and regions that are relative to a zero value. specifies one or more variables in the response data set. Each response variable produces a separate map. All variables must be in the input data set. Multiple response variables are separated with blanks. Blocks are not drawn for the response variable with missing values unless you use the MISSING option in the BLOCK statement. Options in a BLOCK statement affect all of the maps that are produced by that statement. You can specify as many options as you want and list them in any order. specifies a data set to annotate onto maps that are produced by the BLOCK statement. Annotate coordinate systems 1, 2, 7, and 8 are not valid with block maps. A column name defined in either the MAP= or DATA= data sets might be indicated with the column-name value. If the column name exists in both the MAP= and DATA= data sets, the column in the MAP= data set is used. When column-name is used, the areas are colored based on the AREA= value. Duplicate AREA= values might have different patterns assigned. specifies the width of the blocks. The unit of size is the character cell width for the selected output device. By default, BLOCKSIZE=2. outlines all blocks in the specified color. The SAME value specifies that the outline color of a block, a block segment, or a legend is the same as the interior pattern color. The default outline color is determined by the current style. If you specified the NOGSTYLE system option, then the default color is black for Java and ActiveX and the first color in the color list for all other devices. The CBLKOUT= option is not valid when SHAPE=CYLINDER. Note:If you specify empty block patterns (VALUE=EMPTY in a PATTERN statement), you should not change the outline color from the default value, SAME, to a single color. Otherwise, all the outlines are one color and you can distinguish between empty areas only by their size. Empty block patterns (VALUE=EMPTY in a PATTERN statement) are not supported by DEVICE=JAVA. fills empty map areas in the specified color. This option affects only map areas that are empty. Empty map areas are generated in block maps only when a map area is omitted from the response data set and the ALL option is included in the PROC GMAP statement. outlines empty map areas in the specified color. This option affects only map areas that are empty. Empty map areas are generated in block maps only when a map area is omitted from the response data set and the ALL option is included in the PROC GMAP statement. See:The option ALL and Displaying Map Areas and Response Data. outlines non-empty map areas in the specified color. When COUTLINE=area-outline-color and DEVICE=JAVA or ACTIVEX, both empty and nonempty map areas are outlined. The SAME value specifies that the outline color of a map area is the same as the interior pattern color. Note:If you specify empty map patterns (VALUE=EMPTY in a PATTERN statement), then you should not change the outline color from the default value SAME. Otherwise, all the outlines are one color and you cannot distinguish between the empty areas. Empty block patterns (VALUE=EMPTY in a PATTERN statement) are not supported by DEVICE=JAVA. if you specify NOGSTYLE, then the default color is black for Java and ActiveX and the first color in the color list for all other devices. The CTEXT= color specification is overridden if you also use the COLOR= suboption of a LABEL= or VALUE= option in a LEGEND definition that is assigned to the map legend. The COLOR= suboption determines the color of the legend label or the color of the legend value descriptions, respectively. identifies the variable in the input data set whose values create links. Input data set variable values create links that are associated with a legend value and point to the URL to display when the user clicks (drills down) on the value. specifies the LEGEND statement to associate with the map. The LEGEND= option is ignored if the specified LEGEND definition is not currently in effect. In the GMAP procedure, the BLOCK statement produces a legend unless you use the NOLEGEND option. If you use the SHAPE= option in a LEGEND statement, only the value BAR is valid. Most of the LEGEND options described in LEGEND Statement are supported by both Java and ActiveX. If a LEGEND option is not supported by Java or ActiveX, it is noted in the LEGEND option definition. specifies the number of response levels to be graphed for the response variable. If you specify LEVELS=ALL , then all unique numeric or character response variable values are graphed. Each response level is assigned a different surface pattern and color combination. The block height is based on the data value of the corresponding response variable. The LEVELS=number-of-response-levels option is ignored when you use the DISCRETE or MIDPOINTS=value-list option. It is also ignored when the response variables are character. When MIDPOINTS=OLD is used with the LEVELS= option, default midpoints are generated using the Nelder algorithm (Applied Statistics 25:94–7, 1976). Note:If you specified the NOGSTYLE system option, then noncontinuous colors are used by default. If a numeric variable has an associated format, the specified values must be the unformatted values. With numeric response values, DEVICE=JAVA uses only midpoints that fall in the range of the data being used. Thus, if your data ranged from 30–80, but midpoints were specified at 25, 50, 75, and 100, only 50 and 75 are used. 'value-1' <...'value-n'> midpoints="Midwest" "Northeast" "Northwest"
Only those observations for which the response variable exactly matches one of the values listed in the MIDPOINTS= option are shown on the map. As a result, observations might be excluded inadvertently if values in the list are misspelled or if the case does not match exactly. See:Displaying Map Areas and Response Data. creates bars and regions that are relative to a zero value. By default, GMAP creates heights that are relative to the minimum value, which might or might not be zero. With the RELZERO option, zero value bars have no height. SHAPE=BLOCK is the default. OLDBLOCK is the same as BLOCK except that with OLDBLOCK the tops and sides of blocks are colored the same as the background. This exception existed prior to the SAS 9.2 release. specify the physical dimensions of the map to be drawn. By default, the map uses the entire procedure output area. If you specify values for map-width or map-height that are greater than the dimensions of the procedure output area, the map is drawn using the default size. 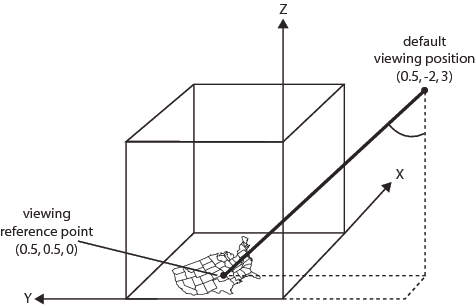 specify coordinates of the viewing position in the reference coordinate system. In this system, the four corners of the map lie on the X-Y plane at coordinates (0,0,0), (0,1,0), (1,1,0), and (1,0,0). No axes are actually drawn on the maps that are produced by PROC GMAP. Your viewing position cannot coincide with the viewing reference point at coordinates (0.5,0.5,0), the center of the map. The value for z cannot be negative. If you omit the XVIEW=, YVIEW=, and ZVIEW= options, the default coordinates are (0.5, −2, 3). This viewing position is well above and to the south of the center of the map. You can specify one, two, or all three of the view coordinates; any that you do not specify are assigned the default values. Although you can use the XVIEW= and YVIEW= options with DEVICE=JAVA, ZVIEW= cannot be used with DEVICE=JAVA. You can use statement options to enhance the appearance of the map. For example, you can specify the width and shape of the blocks, the outline colors for the blocks and the map areas, and the angle of view. Other statement options control the response levels. In addition, you can use global statements to modify the block patterns, the map patterns, and the legend, as well as to add titles and footnotes to the map. You can also use an Annotate data set to enhance the map. By default, block patterns are determined by the current style. When specifying the AREA statement or the AREA= option, the map area colors are determined by the current style and the block colors are determined by the specified attributes. Note: If you specified the NOGSTYLE system option, then solid patterns are used for blocks and hatch patterns are used for the map areas. The map areas and their outlines use the first color in the color list. In addition, the AREA= option and AREA statement control how the map areas are patterned. When you use PATTERN statements to define the patterns for the map, you must specify the correct type of pattern for the area. The blocks use bar and block patterns and the map areas use map and plot patterns. See PATTERN Statement for more information about specifying patterns. Note: If you specify only one PATTERN statement and include only the COLOR= option, that color is used for both the blocks and the map areas. For example, this statement makes the blocks solid blue and the map areas blue hatch. Note: Empty block patterns (VALUE=EMPTY in a PATTERN statement) are not supported by DEVICE=JAVA.